Suppose the laws of physics – including conservation of mass-energy – are truly invariant: the same at every time and place; before, during, and after the Big Bang; inside, outside, and on the boundaries of black holes; etc. No clever “Cosmic Inflation” to get the universe expanding. No physics magic like “Dark Energy” to accelerate expansion. The laws of physics were, are, and always will be, everywhere in the universe, as they are here and now. · One of positive mass Matter and Anti-Matter. · One of negative mass Unmatter and Anti-Unmatter. Initial Conditions: Endless void. No mass-energy. No laws of physics. Time was undefined. Creation Event: Creation of the laws of physics, including conservation of mass-energy. But there were no “clocks” – periodic events – to measure time. Inertia: Caused by self-gravity; therefore present from the start of Big Bang. Initial Expansion: Zero net external gravitational force. Zero net external electromagnetic force. Strong nuclear force – which is repulsive at very short ranges – drove expansion. In this era, particles mixed freely, like molecules in a fluid, because energies were high and only short-range interactions were significant. Therefore the expansion would have seemed to an internal observer to have no center. Cancellation was rare in this era because it requires time for a particle-unparticle pair to form and to decay down to the ground state, from which cancellation is possible. For comparison, the half-life of “positronium” (an electron and a positron) is 0.125 nanoseconds. While this is a short interval under most conditions, it is a very long interval here. The pair would be knocked apart before it could cancel. Segregation and Acceleration. Simultaneously with the above, the positive and negative mass material was separating into distinct regions. Because of gravitational repulsion and cancellation, the regional boundaries were distinct, and there were no small inclusions of opposite sign mass material in the various regions. This separation caused repulsion between unlike regions, which caused accelerating expansion. After a few hours, nucleons appeared and then separated. Inertia caused expansion to continue. After a few years, atoms appeared and then separated. Inertia caused expansion to continue. First generation stars formed. Because there was no spin and only small acceleration, but high material density, they were very large and therefore short-lived. This produced an immense number of both matter and unmatter black holes. Many of these then agglomerated into supermassive black holes, which generally then further grew by absorbing material in an adjacent region with a nearly equal radius from the Big Bang center. This caused them to accelerate laterally and to spin. The lateral motion gave them access to additional material. Galaxies then appeared as the spinning supermassive black holes accumulated orbiting material. All just straightforward application of invariant laws of physics – neither clever Cosmic Inflation nor magic Dark Energy! 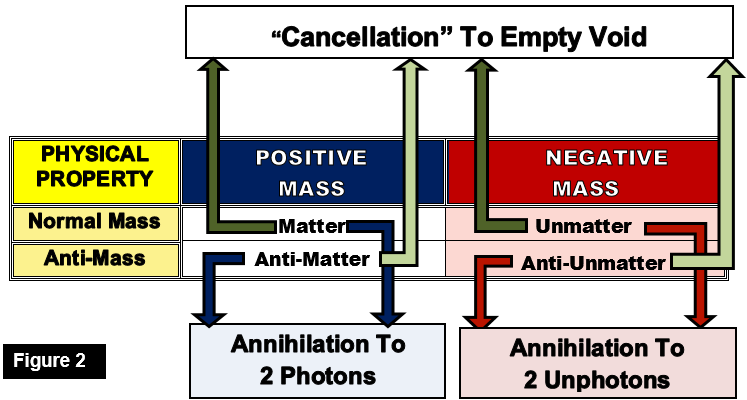 are all symmetric for positive and negative values of m. This suggests a family of negative mass particles (“Unmatter" and “Anti-Unmatter" here), with zero net mass-energy for the universe overall. · But positive m material gravitationally repels negative m material. positron) “annihilate”, they create two 0.51 Mev gamma rays, precisely equivalent (E = mc2) to the sum of the masses of the two particles. By contrast, if an electron and a negative mass unelectron “cancel”, they simply disappear – which is again equal to the sum of the initial masses – zero. There are neither “worm holes” nor other cosmic shortcuts in this model: the speed of light limitation applies everywhere and always except to the Creator Himself. Black holes are not singularities in this model: they are simply quantum mechanical regions of particularly intense gravity. The laws of physics are the same inside, outside, and on the boundaries of black holes, whether of matter or unmatter. We believe that the model proposed here can be described in finite-element analysis computer code to explore aspects of cosmology never before susceptible to such analysis. We hope others with more experience in finite-element analysis will agree and do those analyses. · The creation of an all-positive-mass universe, which is a huge violation of the conservation of mass-energy. · “Dark Energy”, an unspecified material which somehow causes accelerating expansion in the current era. · Earlier appearance of stars than predicted. 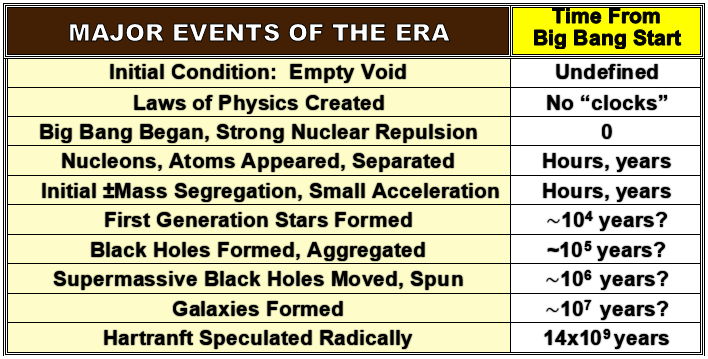 · Earlier appearance of galaxies than predicted. · Earlier appearance of galactic spins than predicted. · Absence of small islands of visible matter in the “voids”. None of these “miracles” are necessary in this model because the combination of gravitational attraction and repulsion is more effective at agglomerating material than attraction alone. Even the Creation Event, which here is the creation of the laws of physics, is unopposed. Two verification experiments: Looking for locations in a sky map where unphotons from an ungalaxy have “cancelled” the positive energy photon "mist" should work. Such locations would be small black dots in the sky map, stable in both time and position. A direct imaging camera may also work. The detector pixel could be supplied electrons at elevated energy. Any transitions to ground state without photon emission should be mostly from unphoton absorption. The lens would be just a drilled block of the same material held at the elevated energy. Unresolved: Note that this model does not resolve Why the Big Bang occurred, nor the individual sphere Masses: these are left to the Creator to decide. Origin of this model: This model is based on broadly accepted physics and cosmology, with strong application of symmetry principles. It is not based on any specific prior work, nor do we know of any comparable work. We would greatly appreciate references to comparable work by others. About the authors: Both authors are graduates of the Cornell University College of Engineering: Robert in Engineering Physics in 1966, and Scott in Electrical and Computer Engineering in 2001. Robert is Scott’s father. This work was made possible by the tireless support of Dr. Martha Hartranft (Robert’s wife, Scott’s mother).